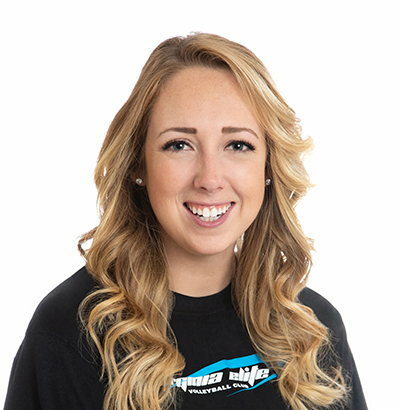 A proud Virginia Elite alumna, Kelsey Hrebenach returns for her third year on the staff as a floater coach and Social Media and Marketing Manager. She brings a wealth of experience in playing and coaching competitive volleyball to the club, including an accomplished run in one of the nation’s most elite collegiate conferences. Hrebenach played for Heritage High School in Leesburg, Virginia, where she helped the Pride to several district and regional titles and led the Washington metropolitan area in blocks her senior year. In addition to earning all-district honors, Hrebenach was a finalist for the 2011 Virginia Gatorade Player of the Year Award and was named to the 2011-2012 Under Armour All-American Watch List. She also helped Virginia Elite to back-to-back Chesapeake Region titles in 2011 and 2012. Hrebenach graduated as one of the nation’s top collegiate volleyball prospects, ranking 47th overall and 16th for middle blockers in the class of 2012 by PrepVolleyball.com. Hrebenach later played an exceptional collegiate career at the University of Maryland, where she was a member of the original group of student athletes to transition the Terps from the Atlantic Coast Conference to the Big Ten Conference. A highly versatile hitter and formidable blocker, she consistently led Maryland across several statistical categories throughout her career. Hrebenach was repeatedly named to both the ACC and the Big Ten’s All-Scholar teams, and she served on the executive board of the Student Athlete Advisory Council for three years. While playing at Maryland, Hrebenach began coaching at the University’s youth summer camps. She then spent her first two seasons of coaching with Virginia Elite as a floater coach and assistant on the 16’s team. Hrebenach now trains athletes of all ages, working primarily with middle blockers. She also manages Virginia Elite’s social media accounts and assists with the club’s marketing matters. Hrebenach earned a B.A. in communications from the University of Maryland. She now resides in Arlington, Virginia and works as an event planner for Convene DC.